Yamaha launches third generation versions of the FZ FI and FZS FI with cosmetic changes, new features, fuel injection and single-channel ABS. Yamaha has launched the third generation iterations of its FZ and FZS naked street bikes in India with prices starting at Rs. 95,000 for the FZ FI and Rs. 97,000 FZS FI, ex-showroom Delhi. In sync with the upcoming emissions and safety guidelines for two-wheelers in India, both the FZ and FZS 3.0 feature fuel injection and anti-lock braking systems. Both motorcycles continue to be powered by the previous generation model’s 149cc, single cylinder, air cooled that now feature a different compression ratio of 9.5:1. The two-valve engine’s power and torque outputs however remain the same as that of the FZ 2.0’s motor at 13bhp of max power being developed at 8,000 rpm and 12.8Nm of peak torque being made at 6,000rpm. The engine continues to be mated to a five-speed gearbox. Both the FZ-FI and FZS-FI models in Version 3.0 spec get a major design overhaul as well as new equipment, including a newly designed sub frame, a higher handle bar position, Bosch single-channel ABS for the front wheel, a rear-wheel disc brake, LED headlamp, LCD instrument cluster and so on. In terms of appearance, the FZS gets a lower engine fairing and partly chrome finished air-intake, a new resin tank cover, sliding engine kill switch, a two-level seat and matte colour options. “The excitement of the call of the blue continues with the launch of the new FZ FI and FZS FI with ABS in India today as part of its offering of extraordinary motorcycling experiences from Yamaha. Following the outstanding response from YZF-R15 version 3.0 launched in the last year, the company is confident to further create a niche in the 150cc class segment with the new FZ FI and FZS FI. The new launch from Yamaha will strengthen the company’s presence in the deluxe class of India,” said, Motufumi Shitara, Chairman, Yamaha Motor India Group of Companies. 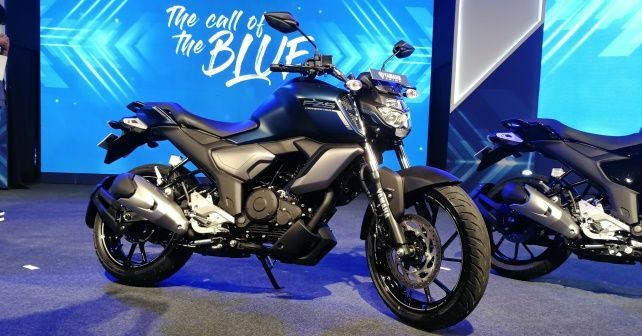 Colour options for the FZ FI 3.0 include Metric Black and Racing Blue while the FZS FI is offering in Matt Black, Bark Matt Blue and Grey and Cyan Blue.